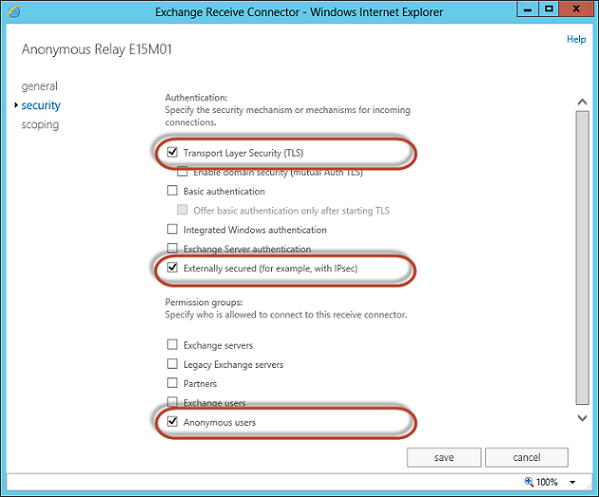 In the last part of this series we made post-install changes to Exchange 2013, and then generated and applied new SSL certificates to ensure we can co-exist happily with Exchange 2007; along with exporting the new SSL certificate as a PFX file ready to import into our legacy Exchange server and TMG server. 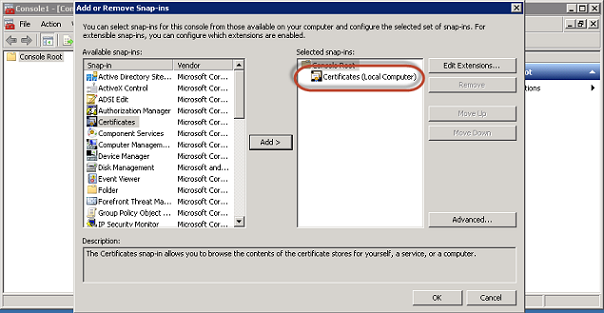 Getting the certificate imported to each server and then enabling the certificate are two separate processes. So by importing the certificate now we're looking to achieve a simple goal: ensure that when we need to enable the certificate on TMG and Exchange 2007, the certificate is already installed and available. 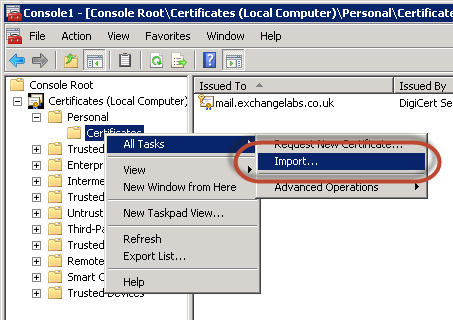 The process to import the certificate into TMG differs slightly from Exchange 2007, as there is no built-in import and validation process for TMG. Therefore to import the certificate onto our TMG server, we'll open up the Microsoft Management Console using the command mmc.exe. 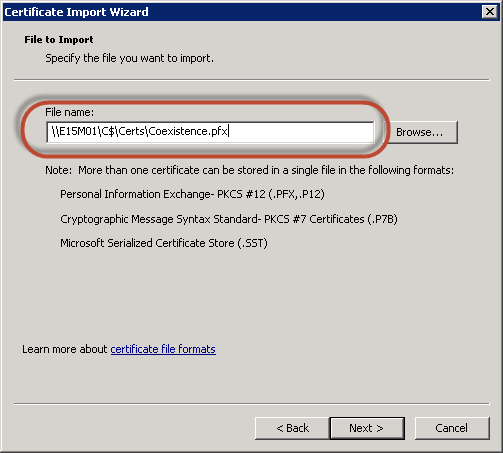 After entering the password to the PFX file, the certificate should show in the list of certificates alongside the currently enabled certificate. The command above specifies the network location that the currently logged on user can access, and will also issue a password prompt to allow us the opportunity to enter the PFX file password. Make a note of the Thumbprint value (as highlighted above), as we'll require this later on when we enable the SSL certificate for use at the point of enabling coexistence. With our certificates in place and ready to go on all relevant servers, and enabled on Exchange Server 2013 it is now time to configure the HTTPS URLs for each of the services Exchange provides. We've already set the Service Connection Point to the Autodiscover name, so we will not need to do this elsewhere. Although the Autodiscover Virtual Directory is listed and can be populated with URLs, there is no need to do so and no purpose is served by the configuration. As we are using a single HTTPS name, mail.exchangelabs.co.uk this is a straightforward process. 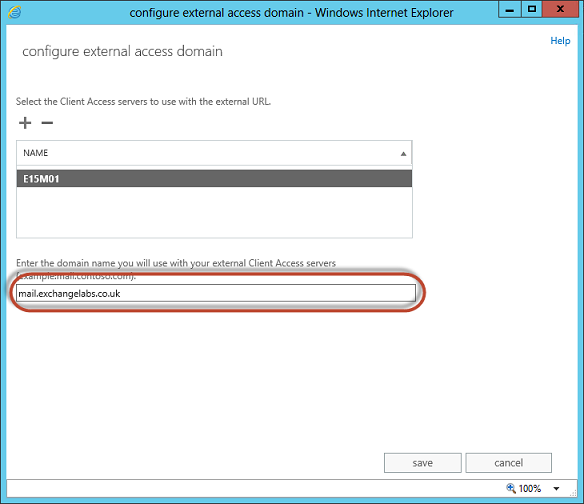 Let's examine how to adjust the Exchange URLs both via the Exchange Admin Center and via the Exchange Management Shell. If you prefer to use a GUI to make changes to Exchange, the positive news with Exchange 2013 is that you can now adjust the URLs for all virtual directories through the Exchange Admin Center. 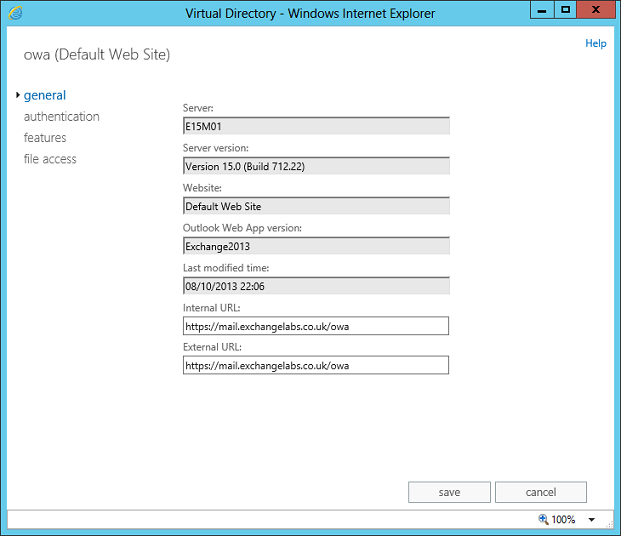 In Exchange 2007 and Exchange 2010, one important virtual directory - Exchange Web Services - had to be configured via the Exchange Management Shell. To change the Virtual Directories URLs used for Exchange 2013, we'll open the Exchange Admin Center and navigate to Servers>Virtual Directories. After pressing Save, behind the scenes the Exchange Admin Center will execute PowerShell to update each Virtual Directory, so this may take a few moments to complete. Although this step saved us some time, it didn't do all the work for us. We'll now need to edit each Virtual Directory for our OWA, ECP, ActiveSync, EWS and OAB virtual directories to update the Internal URL to match. 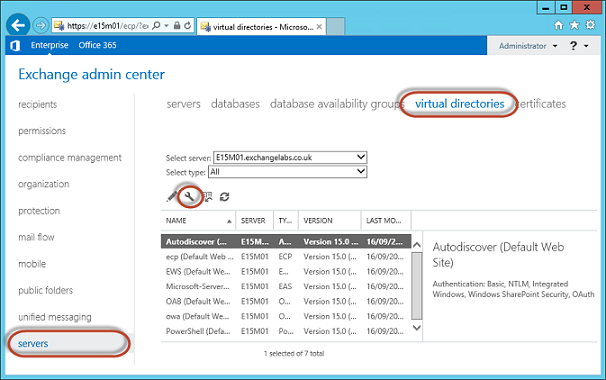 That's every virtual directory apart from Autodiscover and Powershell which should be left as-is. To make these changes select each virtual directory one by one and choose Edit, as shown below. 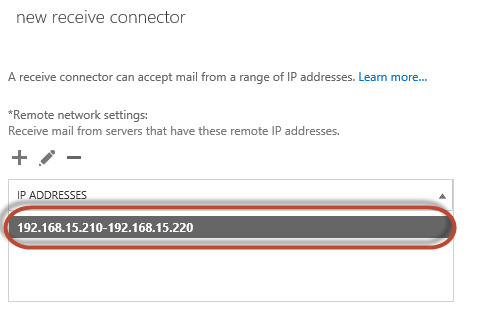 As Outlook Anywhere is the protocol Outlook clients will use to communicate with Exchange Server 2013, replacing MAPI/RPC within the LAN, it's important that these settings are correct - even if you are not publishing Outlook Anywhere externally. 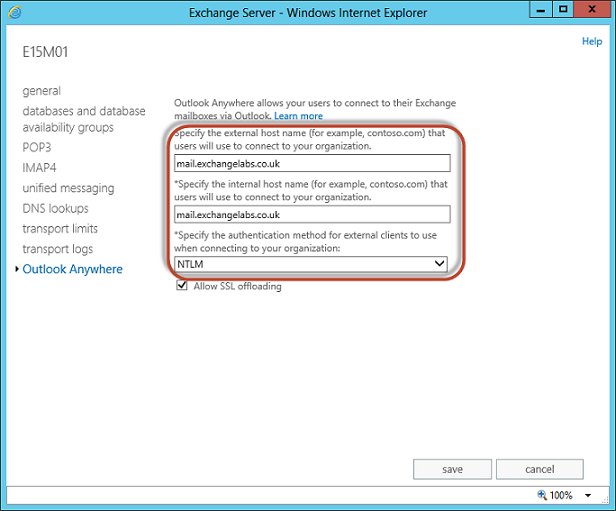 During co-existence it's also important to ensure that the default Authentication Method, Negotiate, is updated to NTLM to ensure client compatibility when Exchange 2013 proxies Outlook Anywhere connections to the Exchange 2007 server. With these settings configured, along with the obligatory iisreset /noforce to ensure they are re-loaded into IIS, we've in theory got our server ready to test mailboxes with. However before we get ahead of ourselves, we'll make sure we've got some additional configuration in place first. 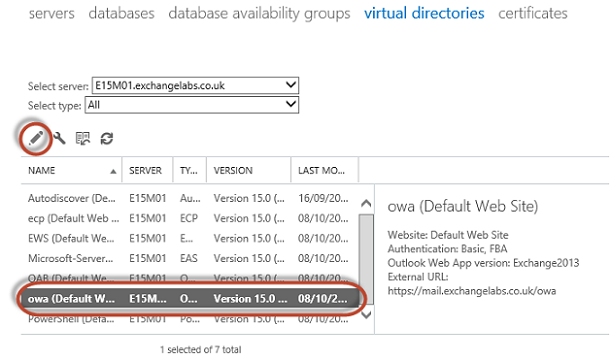 It would be a strong statement to suggest it's vital to configure transport in Exchange 2013 - the defaults are a vast improvement over previous versions - however it's pretty important to make sure the configuration your require is in place before you begin testing your new Exchange Server. Two vital components of mail flow within Exchange are Send Connectors and Receive Connectors. The first, Send Connectors, are stored within Active Directory and retain configuration settings across servers; therefore when we move Send Connectors across to Exchange Server 2013 our main focus for changes is against servers that Exchange sends to, such as mail relays. 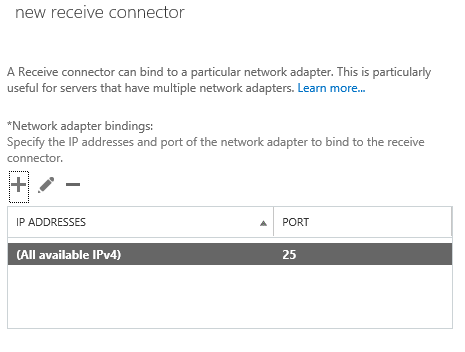 The latter, Receive Connectors are defined on a per-server basis and as such require re-configuration on Exchange Server 2013. 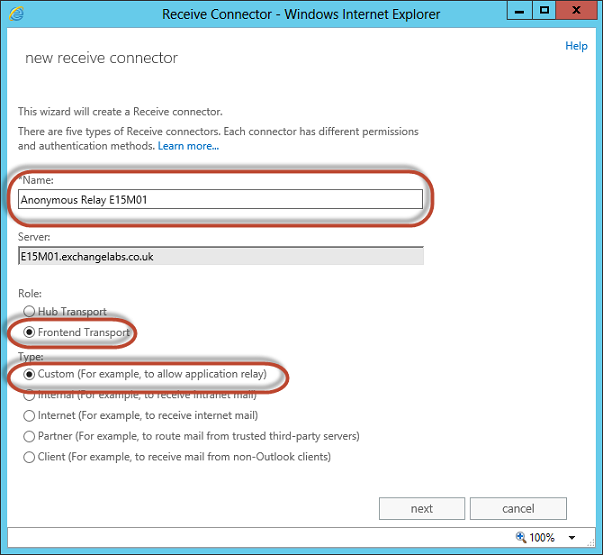 Before we make any changes to receive connectors on our Exchange 2013 server, we'll re-visit the information we recorded from our Exchange 2007 server earlier in the series. If you're familiar with Exchange you'll see that the configuration on our Exchange 2007 server is fairly straightforward. We have the two default connectors Client E12M01 and Default E12M01 both with a small amount of changes. We also have present an additional receive connector, named Anonymous Relay E12M01, which allows clients from a small IP address range to submit mail without authentication intended for both internal and external recipients. 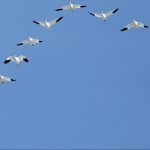 While you're in the Mail Flow section of the EAC you'll also become aware of some great changes - all mail flow related configuration is now held within one place - so you no longer have to navigate to multiple sections to reconfigure Send and Receive Connectors. You'll also notice another change when you view the list of Receive Connectors. 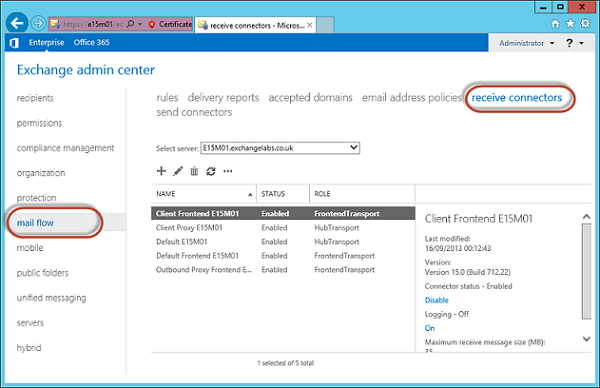 In Exchange Server 2013, receive connectors are now split into Front End Transport and Hub Transport types of connectors - each owned by the Client Access and Mailbox roles respectively. As such we'll need to accommodate these changes when making configuration changes - we won't simply remove the existing connectors and start again. For each of the Default and Client Receive Connectors, we'll examine their configuration, paying special attention to Maximum Receive sizes. These in particular are where we may need to increase or decrease size limits to ensure our configuration remains consistent. For our Anonymous Relay connector, we'll begin by pressing the Add button to begin the New Receive Connector wizard. 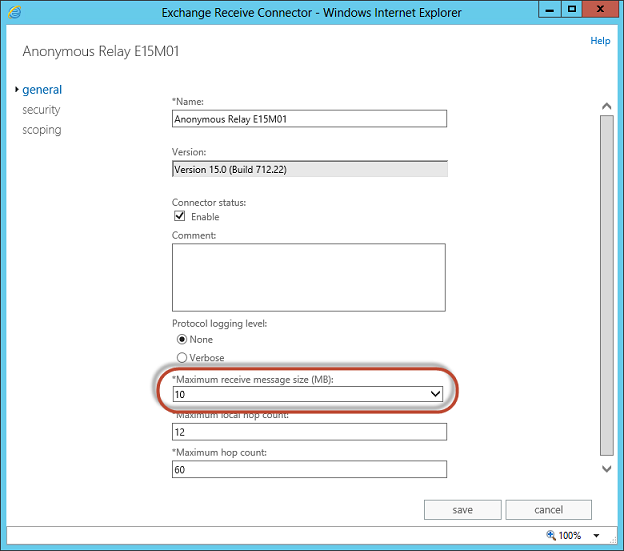 Because your configuration is likely to vary ensure that as you proceed through this wizard you enter relevant settings for your organization, so use this example to help familiarize yourself with how we apply the settings for Exchange Labs’ Anonymous relay connector. With these settings in place, our new Exchange 2013 server should be ready to accept mail using the same set of parameters the Exchange 2007 server used. With HTTPS URLs, Outlook Anywhere and Transport configured for Exchange, a number of key components required before Exchange 2013 can coexist are now in place. In the next part of this series, we'll get our Exchange Server ready for Mailbox Moves by configuring Mailbox Databases before moving onto testing everything works as expected. In section 12 regarding Outlook Anywhere you've missed setting about "Allow SSL offloading" check box. If you're not using any load balaner should this box should be unchecked either way OA will not work ?